I was looking through some old posts today, and realized that there was a problem with my planting mix schedule from my previous post on Planting Styles and Mixes. The counts for each type (in blue) do not add up to the correct total count (in red). The Count (in red) is the correct total, but since the Count is derived from a formula using an Area, it is not an integer. 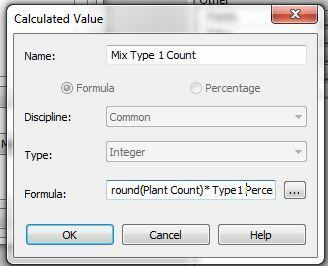 So when it is put through another formula, it results in too many plants in the mix Type counts. I have now updated the original post and Project file, but if you have used or downloaded the old planting mix schedule, be sure to make the change or get the updated version.